For sympathetic relief of mild sunburn and other minor skin conditions. 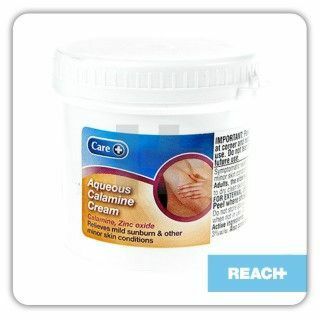 Adults, the elderly and children : apply the cream liberally to dry clean skin as required. Calamine BP 4%w/w, zinc oxide BP 3%w/w, Liquid paraffin , glyceryle monostearate (E471).,macrogol cetostearyl ether 2, cetostearyl alcohol, phenoxyethanol, purified water. If you are unsure about your health condition always speak to a medical professional. All content on this website is only for information purposes and should not be taken as professional medical Advice. Always read the label prior to taking any health or pharmacy product.